Obviously they were only fitted to cars that had the factory SatNav. 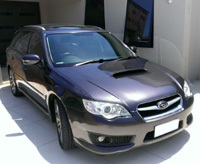 Now, as it happens, I'm selling my wagon, because I'm moving back to Perth later this year. I"m going to look at an identical-to-mine car in Sydney this Friday, to buy and put on the train / truck to Perth. Anyway, it's an ADM Spec B wagon, and it's got the factory SatNav, but no reversing camera. So it's even more on my radar now, to get hold of a factory camera and try to get it working. Keep us updated of how you go, and I'll do the same, but be warned I'm sloooooooowwwww. Cool, hopefully we can work it out . I bought my SpecB Wagon from Perth (I live in QLD). I used Patrick Transport, who were good. Fairly inexpensive and more reputable than some dodgy cheap ones. Yes, I have the factory Nav Screen but had to wire up the Reverse Camera myself. Instructions are floating around on the forum. So you'll have to do that as well, unless you get a factory wiring harness (assuming that even exists), instead of running some wiring yourself. My camera arrived, and it looks like this one below. I haven't tried to fit it yet, and that could be a while before I get around to it as well lol. Last edited by tom_kauf on Mon Aug 06, 2018 5:12 am, edited 1 time in total. Oh wow you found the camera!!!!!!!!!!!!!!!!! Where did you get it from? I haven't even been able to find the camera in a parts diagram, let alone the wiring loom for it. 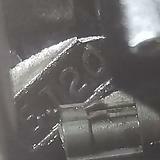 I looked up the part number off the pic you posted - not cheap!! I'm not worried about running cables, good excuse to pull all the trims and carpet and give the car a good cleaning / vacuuming. I didn't buy the car in Sydney, it needs too many things sorting out. Dash is wrecked too from the airbag recall work.............. So will most likely take my one over to Perth from Auckland with me. Factory SatNav in the Sydney car was pretty lame anyway, about the only useful thing it has over a non SatNav car is the maps, the other stuff ( gauges etc ) is basically what the dash tells you anyway, so a bit of a joke really. Nexus 7 will be light years better and with the Tactrix, give you useful information. Yes, it should be the right one. Hopefully it physically fits . This is one of the links that shows a Part# for Gen4s (similar to what I posted a while ago, but this actually shows some Detailed Info). I'm not sure what the 6 different Camera Part#s are, but a Part Number ending in '110' has usually superseded any ending in '100' or '000', and the one ending '000' doesn't list GTs as the applicable version. I also bought some of those Washers it mentions (from a local supplier). Not sure if they're needed, but they were cheap. I didn't get the 'CAMERA CONTROL ASSEMBLY' though, so hopefully that's not needed if we've done the wiring to the Reverse Lights etc ourselves. The exact Part# I got is: 86267AJ10A (the picture shows a number ending '10B', but that was just a sample picture I found while I was on my phone). It's different to what the link above shows for your cars (86267AG110), but I had no luck finding that Part - and it looks identical if you compare the diagrams. Another one that comes up in places is 86267AJ100 , but that's REALLY expensive (Aus$500), so the I one I got for ~$US$170 is cheap in comparison lol. I got it from https://www.subarupartsdeal.com/ . They had an Amazon listing, but it looks like you can order directly from their website (either 86267AJ10A or 86267AJ10B). There is also an Ebay listing open at the moment, if you google 86267AJ10B. And I used a freight forwarder (mailbox in the US), because their Amazon listing said they wouldn't ship to Aus. Thanks for the info, that is pretty much what I had used to install the aftermarket camera. I now just need to find out which pins on the Factory Subaru Camera are for what. Ah ok, probably a good decision to import your car. Exactly, I have the latest SatNav Disc, and still use my phone instead (the Nav Screen is cool, but not very useful). My dash was also wrecked by the dealer, but I used the current deteriorating-dash-issue (dashes becoming shiny and cracking, which Subaru has acknowledged) to get it replaced for free. Thanks for the info and links Tom. The only thing that makes me nervous is that they are all listed as being for 2009-2011 or 2010-2014, which are both Gen 5 cars. Yeah, I wish they were more common in Gen4s. Because of their rarity (basically only for JDM cars, and then only in the highest spec), so few sites list them. It looks like they became much more of a standard feature with Gen5s. I'll see how mine goes. If it has standard power pins and standard NTSC video output (that the screen can display), we should be ok. 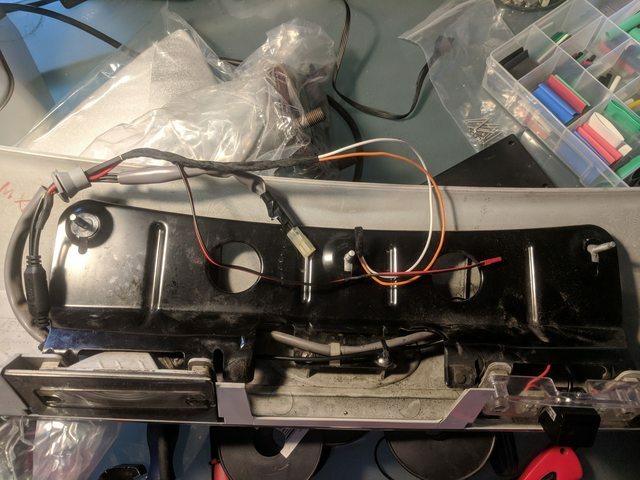 I installed my reverse camera, was a total pain in the bum to route the cable and do everything. Thanks HardwareBoB. I had already installed mine, but an aftermarket one. So there shouldn't be any extra routing of cables, just getting this factory one working. Hey Tom, have you found time to install the factory reversing camera yet? BMCracer wrote: Hey Tom, have you found time to install the factory reversing camera yet? No, unfortunately not :/. I wish I had made any progress, but I haven't been able to find out which 3 pins of the factory camera are power, ground and video.